Claddagh ring is a great way to showcase your Irish heritage and Old World sense of style. The Claddagh ring originated in the Irish fishing village of Claddagh, on the outskirts of modern-day Galway City. The iconic design shows a hand holding a heart wearing a crown. Together, these symbols represent friendship, love, and loyalty. Our Claddagh engagement rings feature this symbol with low-profile engravings and eye-catching designs. Because of the rich symbolism infused into each of these rings, claddagh wedding ring is a perfect choice for Celtic men and Claddagh engagement ring is perfect as ladies’ promise rings. 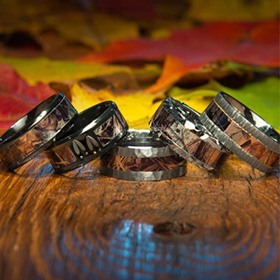 They will help you capture deep symbolism and pride when you tie the knot or make a commitment to one another. Celebrate your heritage while honoring a timeless tradition with beautiful Celtic rings. 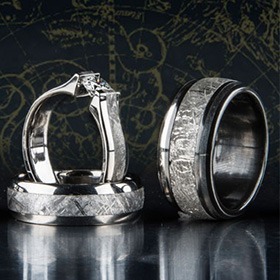 Designed to pay tribute to the richest and most noteworthy Celtic traditions, these Irish rings are perfect for any jewelry-lover who wants to show off his or her heritage, every single day. Celtic knot rings feature the Celtic knot, also called Icovellavna. It is a stylized knot that has come to represent the centuries-old craft of Celtic artwork. Used as early as the 8th century, these basketweave-style knots feature an endless infinity pattern to represent timelessness, friendship, unity, commitment, and — of course — pride in the Emerald Isle. We incorporate these symbolic patterns on our Celtic rings with beautiful engravings, laser-carvings, and more. Much like the deeply-rooted symbolism found in the Celtic knot and Claddagh, our men’s claddagh rings are designed with timeless flair. Titanium is so lightweight you’ll forget you’re wearing it, but it’s stronger than steel and is highly scratch-resistant. For that reason, our claddagh rings are sure to become a family heirloom. 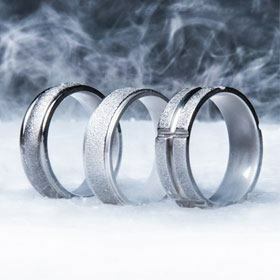 Titanium-Buzz’s team of dedicated jewelry crafters has designed a large selection of beautiful men’s and women’s Celtic knot rings for all personal styles. 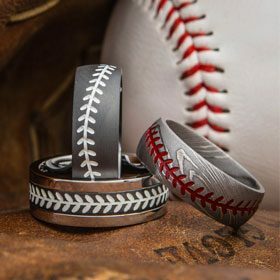 From our simple yet symbolic Laser Engraved Square Knot Celtic Ring that’s perfect for the classicist, to the cutting-edge Men’s Blacked Out Claddagh Ring, there’s a style in this selection to suit you! Don't see what you're looking for? Please give one of our friendly and knowledgeable customer service experts a call or send us an email. We have tons of customization options and specialize in one-offs and custom designs. We will work with you and our designers to get exactly what you need. Past, present, and future: Discover more designs that borrow from timeless art in our special collection of mokume gane rings.